Get your ticket worth AED 285 for AED 125 ONLY with your Finance House or CartNet Credit Card! 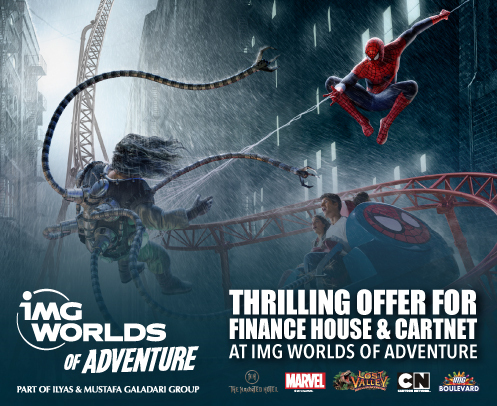 You are welcome to bring up to 6 of your family members or friends and avail the same rate to enjoy IMG Worlds of Adventure rides, shows & unique attractions. Valid for Finance House & CartNet Credit Cardholders. Offer valid from 6th March until 10th March 2019. AED 125 will apply for Adult & Junior admission ticket. ID holder + 6 (Total of seven) can avail the same rate. Children under 1.05 m in height enter for free. Tickets are non-refundable and cannot be resold. Park Terms & Conditions Apply.